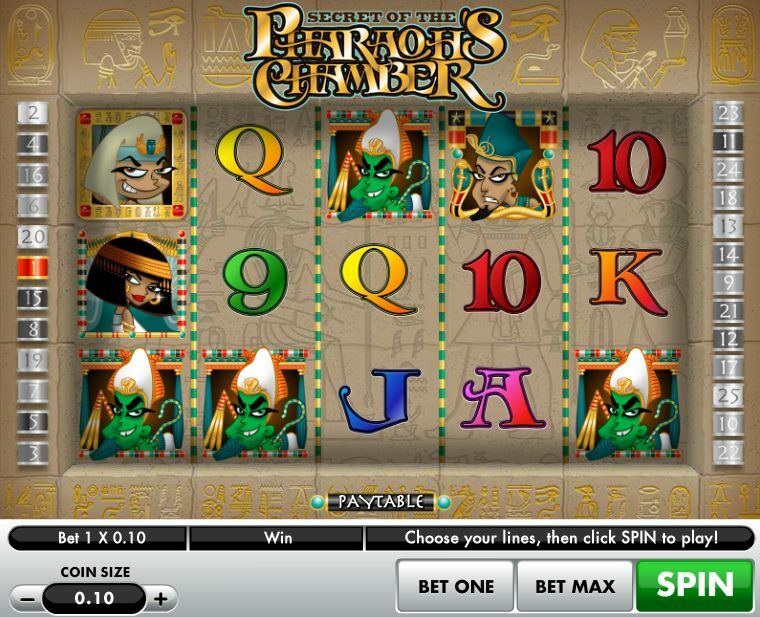 Gamesys's Secret of the Pharoah's Chamber is just the developer's contribution to a long and illustrious list of Egypt-themed, treasure-packed online slots. And with just the one free spins bonus round (albeit one with at least a couple of extra layers to make it more interesting) this will have to go some to beat the likes of IGT's legendary Cleopatra or Play'n Go's treasure-hunting slot, Aztec Idols. This 5-reel, 25-payline slot has coin bets in the range of $0.01 to $1.00, and there are some nice-looking Egyptian characters adorning the reels. As well as some 9-to-Ace symbols, there's an evil-looking priest, two Pharaohs and a Cleopatra-esque beauty. The Wild gold icon is, erm, Wild and substitutes for all regular symbols in the game other than the Scatter. Look out for the game logo icon; three of those Scatters on Reels 1, 3 and 5 triggers the main bonus game - Treasure Hunt free spins. When you activate the bonus round, three gold coins replace the Scatters on-screen. Simply select one of them to reveal how many treasures you can pick in the next phase. On the second screen you will see 14 treasures in front of you. 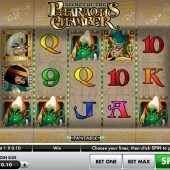 Click on however many you were awarded in the initial stage to reveal free spins and multipliers. Once done you will play out your free spins. Secret of the Pharaoh's Chamber is a frustrating little game. Sure, it looks fine and it's fun enough to play, but the one bonus feature is just too hard to trigger. There does seem to be a lot of quick, regular wins to be had in the base game, but without the lucrative bonus round it hardly seems worth it. If you don't mind losing a tonne of cash before hitting the odd bonus feature, that's fine; for me, I'll stick with the two Egyptian slots I mentioned at the top of the review.